South Beach Facilities is scheduled to close on Monday, April 29. 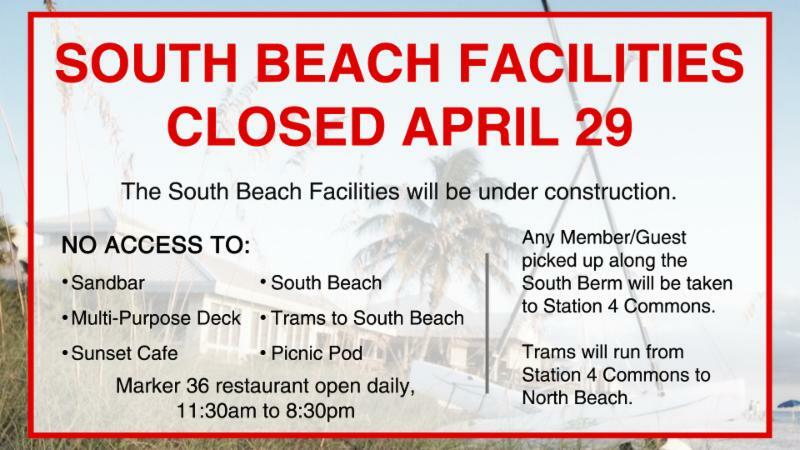 There will be no access to Sandbar, Sunset Cafe, the multi-purpose deck, the picnic pod, South Beach, nor will there be any trams heading to South Beach during construction. For members and guests who normally ride the tram along the South Berm, trams will be transporting people to Station 4 at the Commons where members can then transfer to a tram heading to North Beach and Marker 36. Marker 36 restaurant will also be open daily from 11:30 a.m. to 8:30 p.m. Please note that the last Saturday breakfast and Sunday brunch will be served on Easter weekend. While we understand that this will impact members who regularly frequent the South Beach facility, it is our goal for members to have an equally enjoyable experience at the North Beach Facility. The Foundation will communicate any further information as construction progresses. The South Beach renovation project is aiming for completion by mid-November.